Made by Scalecraft Models in Auckland, New Zealand, 1993-1994. 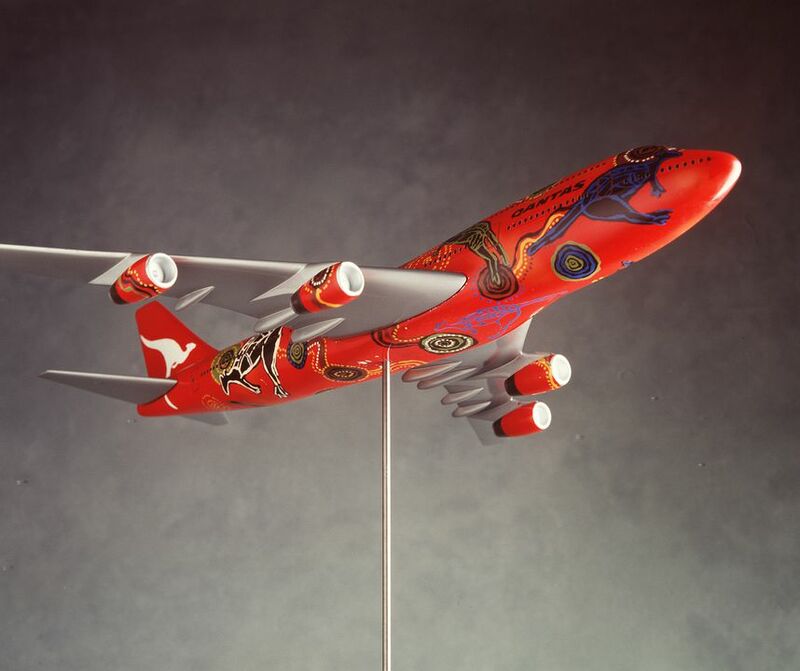 This model was a prototype for the livery of the full-size Boeing 747-400 aircraft spectacularly painted for Qantas with the ‘Wunala Dreaming’ design of Balarinji Designs, Adelaide. The aircraft regularly and arrestingly emblazons local and international skies. It is an outstanding example of contemporary Australian graphic design for advertising. Model of a Boeing 747-400 aircraft painted in the "Wunala Dreaming" motif. The model is supported by a metal and wood display stand. A print of the Wunala Dreaming motif is included. This model is a hand painted design mock-up by John and Ros Moriarty for the repainting of the full-size Qantas Boeing 747-400 aircraft. The 'Wunala Dreaming' design tells the story of journeys by spirit ancestors, in the form of kangaroos, across the Australian landscape in ancient times. The artwork, created by the Balarinji Design studio of Adelaide blends contemporary graphic style and traditional aboriginal motifs in distinctive colours based on the Australian landscape. The Balarinji team of Aboriginal and non-Aboriginal artists has attained recognition in recent years through its distinctive graphic imagery and fashion designs. John and Ros Moriarty say the concept uses styles from Northern and Central Australia. Wunala Dreaming comes from the Yanyuwa people from Borroloola on the Gulf of Carpentaria.